Why choose paintball in Minneapolis? When it comes to finding a fun outdoor activity that an entire group of people will enjoy, the first thing that you should consider is paintball in Minneapolis. This is due to the fact that paintball is an activity that everyone can enjoy even if they have never played before. If you play at a facility such as Action Packed Paintball Games then everything you could need is available onsite such as CO2 and compressed air fills. This makes it perfect for those who are just experimenting with paintball. Plus, one nice feature of this place is that they offer paintball games to individuals as well as to groups. Therefore, if you and a few friends want to just try out the sport of paintball you can walk in and play at any time. Walk-ins are actually available to all groups made up of less than eight people. Therefore, you can literally play just about any time that you like. There are even season passes available if you plan on returning to the outdoor paintball park on a fairly regular basis. It does make for a great weekend activity. 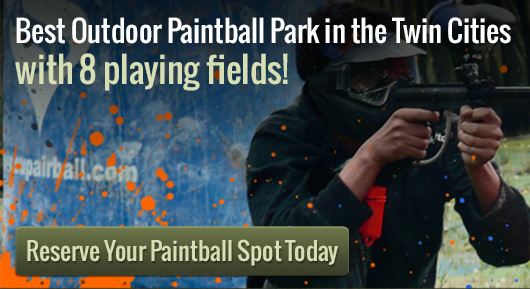 On the other hand, if you are thinking about paintball in Minneapolis for an upcoming event you can also call and reserve the park for your activity. Many people find that paintball is a great activity to plan a birthday party or a bachelor party around. Given the fact that you can book the park and play several rounds it pretty much rounds out any party and guarantees entertainment everyone can enjoy. We can accommodate groups as large as 150+. We are capable of running private games 7 days a week, dawn until dusk. Please call us at 952-492-6776 if you have any questions or if you would like to reserve a time. Please call ahead in advance as reservations are required.